Parks & Recreation magazine recently sat down with Merrie Talley, PLA, LEED, principal of Talley Landscape Architects, Inc., to learn from her about a method she’s spent the past 10 years learning how to do and that she calls “regenerative land management” (RLM). TLA is happy to be a part of the PLAN and LAND Strategic Planning of the respective programs. The new 2-mile segment of the greenway is the first of a series on Greens Bayou to be built by the Houston Parks and Recreation Department. The Bayou Greenways 2020 Initiative will create a 150-mile network of connected parks and trails along the major waterways of Houston. Talley Landscape Architects, Inc., is happy to support the Texas A&M College of Architecture by providing internship opportunities. Merrie Talley, founding principal of Talley Landscape Architects Inc., and Outstanding Alumna of the College of Architecture, will focus on sustainable development. Talley Landscape Architects, Inc. had a successful 2018 Association of Water Board Directors Conference in San Antonio, Texas. Glad to see many familiar faces and several lucky winners went home with beautiful soft sided coolers. Mr. Greg Miller is the president of ASLA and a graduate of Texas A&M University. He is the president of the firm Morrow Reardon Wilkinson Miller Ltd. In Alburquerque, New Mexico. Mr. Miller has a diverse range of project experience ranging from parks and recreation facilities, schools and campuses, and residential landscapes. TLA has been supporting the Texas A&M Landscape Architecture and Urban Planning Department throughout the years. This year we were able to once again seek the best that the department has to offer. Mandolin Prairie is well underway with Spring plantings to come. This is part of Phase III of the MUD No. 230 Masterplan. The Greenways initiative is a seven year program that has already reclaimed several neglected waterways near downtown. Talley Landscape Architects is excited to be a part of this wonderful reinvention of our Bayous here in Houston. The presentation is a two part class, that will provide architects (AIA) and landscape architects (ASLA), contractors, facility managers, maintenance crews, and owners insight into establishing a framework for managing natural growing systems. Outley Elementary was one of eleven SPARK Parks dedicated in the month of November (2017). 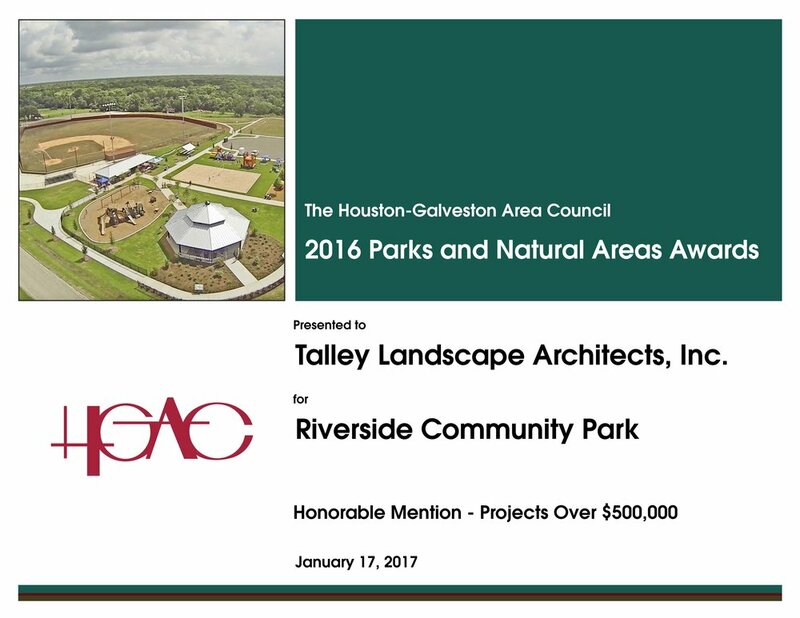 Talley Landscape Architects, Inc. was able to help in the design of the park which features a unique gateway. Talley Landscape Architects. Inc. is sad to see Dr. Ming-Han Li leave Texas A&M Landscape Architecture Department but wishes him the best in his new adventure. Best wishes. The event was hosted by King Richard (Andrassy) and Maid Mary (Shinn) at their home in ye ole Sherwood Forest. 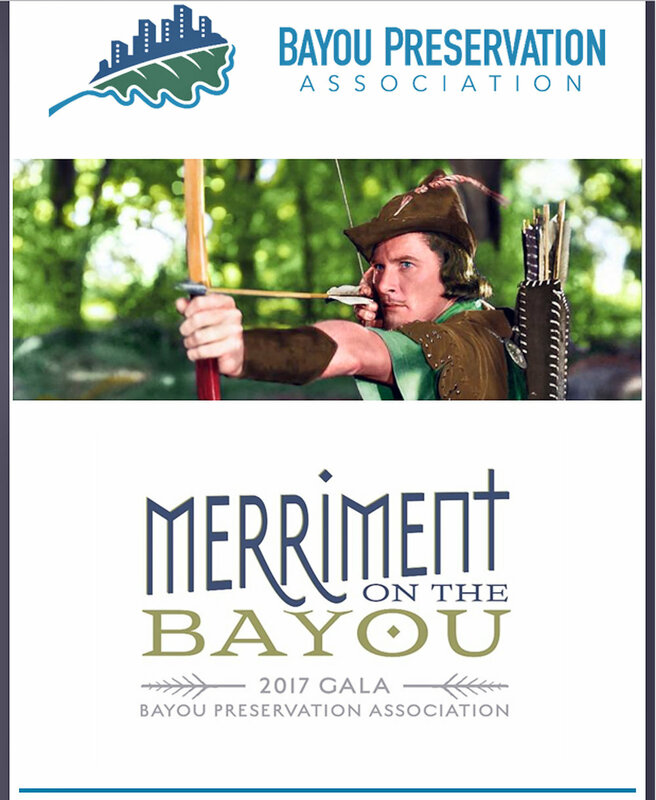 The Bayou Preservation Association works to safeguard the richness and diversity of the region’s bayou systems. The Association engages volunteers, advocates, and supporters like you to ensure these precious natural waterways are preserved for generations to come. Talley Landscape Architects, Inc. had a successful 2017 Association of Water Board Directors Conference in Corpus Christi, Texas. Glad to see many familiar faces and two lucky winners went home with beautiful plants. 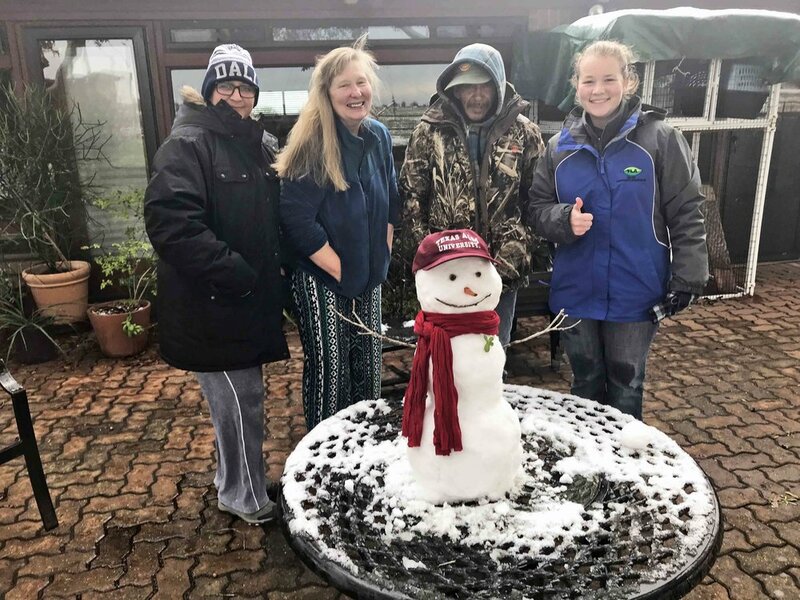 The event is hosted annually by the Texas A&M student chapter of the American Society of Landscape Architects and includes charrettes, panel discussion, and guest speaker presentation.